Lewes Racecourse was the fourth oldest in England. From the early 1700s until September 1964 it attracted top thoroughbreds, famous jockeys and large crowds of race-goers, including royalty. 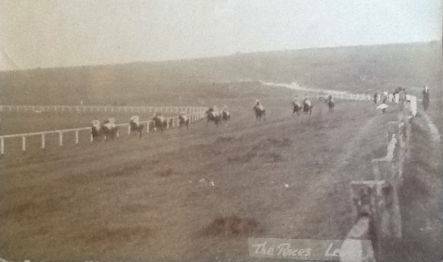 At one time in the 19th century racing became the biggest employer in Lewes, in competition with the flourishing local iron and brewing industries. John Turley’s talk traces the history of Lewes Racecourse and its impact on the town, as well as looking at some of the characters associated with this once-thriving industry. Over the winter, we asked lecture attendees to complete a questionnaire about LHG’s program of events, activities and benefits. This is a brief report on the results, and how we’ve reacted to them. About two thirds of those completing the survey were LHG members. Those that were not gave a variety of good reasons for not joining. Viva Lewes and Sussex Express are currently the most common sources of information about our events, with Lewes News, our bulletin and our website the next most popular. We’ll keep using these channels for our publicity. We’ve also decided to be more active in inviting new/occasional visitors to sign up for email updates on our program. Respondents suggested a wide variety of topics for future lectures: we’ve addressed some of them already (local businesses (2), the Priory), and more will follow. The core of our public program to date has been our monthly lectures, so we asked what other activities might be of interest. Visits/trips to local places of historical interest were the most popular suggestions, and we’ve addressed this with our Outings program, detailed on our website and in our monthly bulletins, and announced at our lectures. There have only been three outings so far, and uptake has been modest: if you’ve looked at the program and decided not to attend any, we’d like to know why, so that we can better meet your interests. Please let us know. Finally, the responses showed that our monthly Bulletin is widely appreciated, with very little in the way of suggestions for change. It will continue as a core part of our efforts. The 50th edition will appear later this year, and we will be publishing an index to their content. 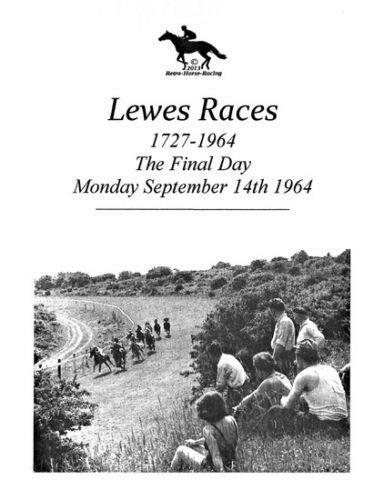 This copy of the Souvenir Race Card from the final day of Lewes racing was offered for sale on ebay in November 2013. The image on the front of the race card comes from a 1951 race, the Falmer Selling Plate. 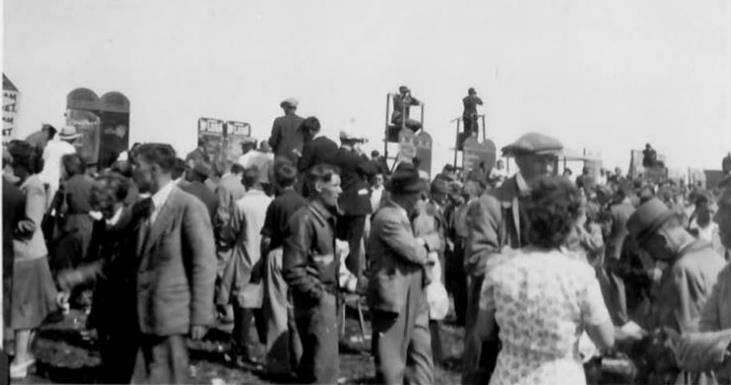 The photograph of race-goers and bookmakers below, taken at Lewes Races in August 1949, was placed on the Lewes Past Facebook page by Steve Dumbrell’. This final picture is from an undated postcard, of rather disappointing quality, offered for sale on ebay in March 2014. This escape with have taken place from the old House of Correction on North Street, now better remembered as the Naval prison. The £40 reward offered would represent the annual wages of a typical labourer. 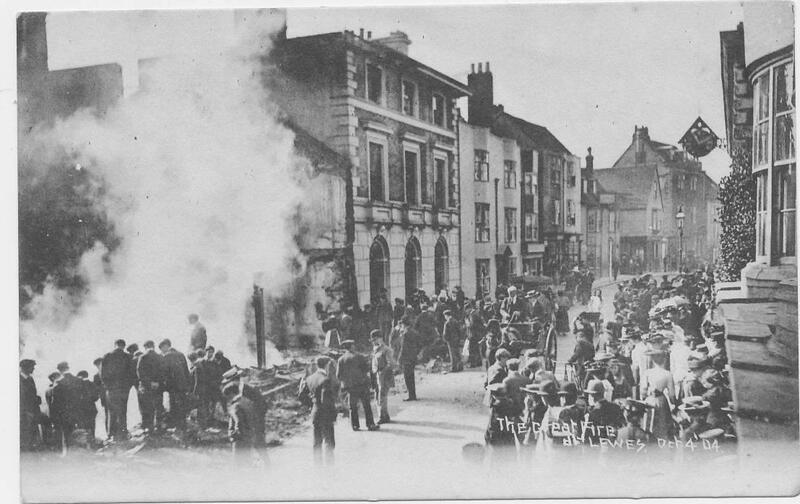 Postcards featuring this fire, which destroyed the premises of a long established High Street company on 4 October 1904, are relatively common. A photographer from the Mezzotint Company, Brighton, arrived in time to witness the outcome of the best attempts of the Lewes fire service. This one, at a slightly different angle from most, makes it clear exactly where the premises destroyed were located. 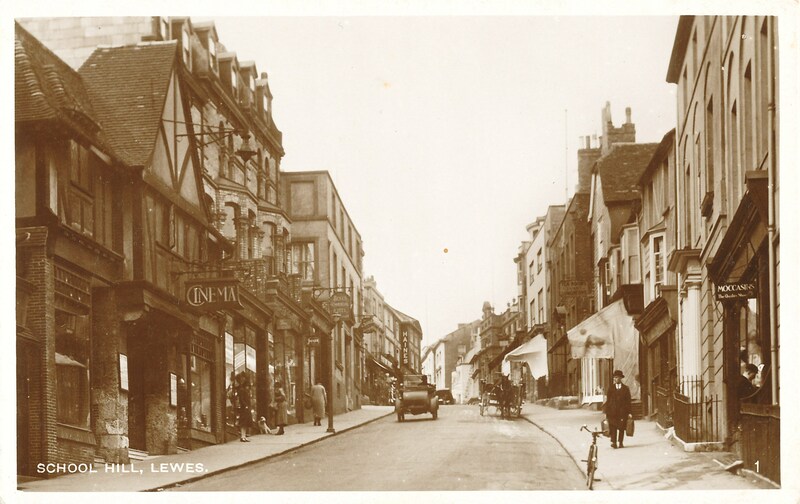 The Cinema de Luxe stood on the site on School Hill now occupied by the uncompromising Temple House office block, until recently the home of the Sussex Express. It was opened in 1912, with 490 seats, and then re-opened in 1934 with a balcony that increased the capacity to 620. This still left it quite a lot smaller than the rival Odeon in Cliffe High Street (also opened in 1934), which could seat almost 1,000 people. The Cinema de Luxe closed in May 1963, and lay derelict for several years before being demolished. Source: http://cinematreasures.org/theaters/. The image is from an undated inter-war postcard, publisher unknown. I remember well the Odeon cinema in the Cliffe, especially the lady in the booking office – with a congenital squint – asking (with her eagle eyes) – “How old are you?! !” to children trying to get age reductions, or the viewing of `X` certificate films. I believe the Sussex Express” newspaper reported when the Cinema De-Luxe (in School Hill) closed that the Odeon would not also be closed. Alas some years later the Odeon was also closed! Regarding the Cinema De-Luxe, my father remembered the delivery of the six foot speaker for that cinema. He also told me that the manager recorded Bonfire Night on a cine-camera, showing the results at a special screening presentation soon afterwards. Next door to the Cinema De-Luxe was a sweet shop, called ‘Candies De-Luxe’. This entry was posted in Cultural History, Economic History, Legal History, Lewes, Local History, Social History. Bookmark the permalink.